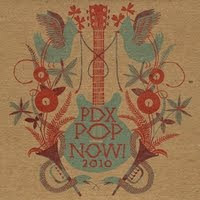 Local compilations like PDX Pop Now! 2010 are by their very design a mixed bag. This just happens to be one of the better ones that I've ever heard. Over half of the 40 songs are really good. Of course, some the bands I've seen a couple times and love, like Hockey, Mean Jeans, and Blitzen Trapper. I was actually introduced to the Mint Chicks on last year's compilation and have loved them ever since (and they are on again with the new "Bad Buzz"). While the unreleased Blitzen Trapper song, "Look My Way" is a treat, it's bands that I don't know well that make the compilation worth my time. I had to go buy their album after hearing, Boy Eats Drum Machine's electro-island hook on "Hoop + Wire" (mp3). I can't find much on AgesandAges, but I love the rolling sing along of "No Nostalgia" (mp3). Deelay Ceelay updates the Peanuts soundtrack for the electronic age on "Tange Ceelay", while Light For Fire delivers gruff and upbeat indie pop on "The Letters". While I could try and list all the other great songs by Mike Coykendall, Nick Jaina, Sean Flinn, Death Songs... I don't want to just rehash the track listing. Since it is only $8 for 2 discs, there's no excuse for not picking it up and finding your own favorites. Although not many of these bands are actually playing the festival, it's a cool snapshot of what's happening in our musical city.